Tatkal Booking is a facility provided by IRCTC for people who need to book a train ticket at short notice. However, due to limited seats and huge demand, the booking process often leads to frustration. Booking a Confirmed Tatkal ticket from Irctc is like you have won some lottery. It’s not easy to book tatkal ticket from Irctc, as there are only a few seats and most of them get booked in few seconds of Tatkal booking start. You can either book it from railway ticket counter or from www.irctc.co.in. This is the only site where you can book your Train tickets. But don’t worry, I have some Irctc Tatkal booking tricks. Just follow these methods, you will surely book your confirmed tatkal ticket. Note: Now you can only book 2 Tatkal tickets a day and max 6 ticket a month from one account of Irctc from 15 Feb.
1. Fast Internet Connection: You need to have good internet connection say about 1-2 Mbps. As tatkal tickets get booked fast, if your internet connection is slow, you will lose the tickets. 2. All Details in Notepad: Just fill up all details in Notepad file, Passenger name, age Id, phone no, payment details like card no etc. This will make your working faster during Tatkal booking as you do not need to type at that time. 3. Some Browser Plugins and Softwares like Magic Auto Fill, User Agent Switcher, Adblock Plus etc. 4. An Irctc account, if you don’t have one then create Irctc account now. 5. Knowledge to book ticket on IRCTC: For this, you can read my guide on How to book train ticket on Irctc. Tatkal Timings 2018 : Tatkal booking timing is 10:00 AM for AC Class and 11:00 AM for Sleeper class daily for one day in Advance i.e if you want to book ticket for tomorrow then its booking will start today at 10 am. Tatkal Charges 2018 : Tatkal charges depend on your category and base fare, they have different tatkal fees according to your category and base fare. If you want to cancel a tatkal ticket, no refund will be given. So, book the ticket responsibly. While booking Tatkal Ticket, you need to have Valid id proofs and you must carry these proofs during your journey, without these id proofs your ticket will be invalid. Note: According to the recent news about Tatkal ticket, you will not need ID proof while booking a ticket on both offline and online ticket booking from September 1st. There is 10 valid id proof for irctc tatkal and general train journey. 7.Nationalized Bank Passbook with a photograph. First, go to myrailinfo(dot)in and install the browser plugin into your Firefox browser. Now just open the plugin from top right corner of the browser. Fill all your details, your Irctc user password, your journey details and passenger details. If you feel comfortable you can also fill payment details. Otherwise, leave it blank. Now just click on Save Data option. Now open Irctc and login to your account. All the work will be done by this tatkal booking software. Now at the end, you just need to fill captcha and click on next. 1. Adblock Plus : If you will open Irctc website, there are lots of ads, due to which it takes time to load pages and slow down your booking process. So to block these ads and increase your page loading time, just use this Ad Block plugin. It will block ads on all website and help you book ticket fast. You can install it from here: adblockplus.org. It is available for most of the browsers, chrome, Mozilla etc. 2. 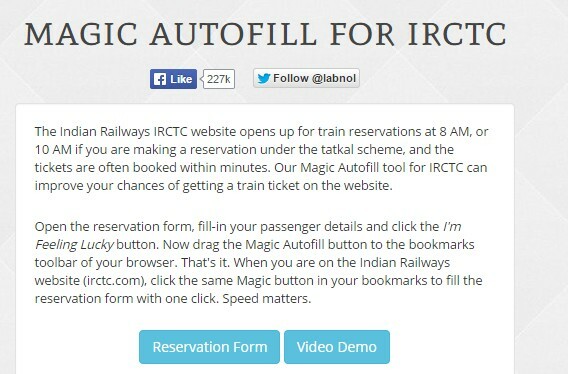 Magic auto Fill : This tool is specially designed to fast up your Tatkal Booking. This tool helps you to book ticket quickly by filling all your details automatically. 3. Now it will load a form, which is a replica of original Passenger detail form on Irctc website. Just fill all the details of passengers, their name, age, id card details and phone no. 4. Click on I’m Feeling Lucky Button and it will create a Magic autoFill Bookmarklet. Just drag it to your Browser Bookmark tab. 3. Search your train by entering station names. But don’t use Tatkal Quota this time ( As Tatkal Scheme is allowed only after 10 a.m, so use General instead of Tatkal). Now keep doing some tasks to prevent session timeout. You can check the train seat availability between two station in many ways. 4. Now, wait for your watch display 10. Now quickly chose Tatkal quota and Click the Find Train Button. 7. Now Click on Make Payment Option. You need to create Irctc e-wallet account for this. But e wallet of Irctc does not work at the time of tatkal. SO you can use the Paytm wallet for fast tatkal booking and can also save money. After this, you can add the amount to your e-wallet using your debit/credit card or net banking. Then at the time of ticket booking, you can simply pay from your ewallet , you do not need to enter your debit card details. It will save a lot of time and make your booking faster. You can use all these tricks to book Tatkal ticket on Irctc. If you get any problem in Tatkal ticket booking on Irctc, just comment below. I and my team will always ready to help you. Login to irctc account by entering your Username and Password. In The “Plan my travel” page you will find a link for eWallet Registration. Click on “Click to register now!” link for eWallet registration. The post contains all the links and tricks for Irctc tatkal booking. Could you please specify which link you are talking of. Yes , Irctc won’t allow e wallet during tatkal booking. At that time you can use normal mode of payout. then why did u suggest that option ??? bhai kindly updated new paymetn option according to new rules… m wating or kindly tell me over mail or do me a miss call on 9015451315 .. i need help imidietaly..
bro which payment options you are talking of, they have added paytm and i have already update it. I am continuously trying to book a tatkal ticket but unable to do so. I had already filled the details in my railinfo but site is not working between 10 to 10:10. its not working. Bro just install railinfo plugin in your Mozilla firefox, it will work for sure. I have recently booked a confirm tatkal ticket with this trick. Bro Dharmesh, I seem to have a problem getting Railinfo plugin to work in Firefox. Though the plugin is installed, 1) how to check the version no. and 2) the instructions say that Ctrl-M is not working, so use “Book Manually”. The Railinfo page does not show this option anywhere. Pls guide how does this plug-in work once all the details are filled in it. To clearly describe how this rail info plugin work i am making a complete video for this. I will soon update you with the latest Irctc tatkal booking trick video. 1. Can we book the Tatkal ticket by Google chrome instead of Mozilla ? 2. I am using Tatkal Now extension while booking. So Magic Autofill is more powerful extension than Tatkal Now ? What will you suggest? 3. Last but the main trouble I am facing is when I try to login at 10 am or 11 am, it doesn’t process properly. Is it necessary to refresh it immediate after tatkal time starts? What is a proper way to Login at this peak time of Tatkal? Also please share your Mob no. plz suggest some way to overcome this problem . Yes this is happening from last few days, Irctc site showing this message. We are figuring it out and will come with solution soon. Well its the first time i heard of such thing that if you are near the server your ticket will be booked fast. As i don’t have any knowledge regarding this, i can not comment on this. while booking more than one tatkal ticket in one transaction, do we have to provie the ID Proof( PAN/Adhar/…) details for every passenger or just for the first passenger should be enough? traveling in train, will be treated as traveling without ticket and charged accordingly. whether paytm mode of payment is still in use!! At 11AM I saw 174 tickets available for Secunderabad Machilipatnam Express.I filled in the details and it took me around 3mins,but by that time my ticket went for CKWL 4. I don’t know whats happening at the back end and how come in 3mins 170+ tickets are booked.There is definitely something fraud happening at the back end. Main Problem is OTP generating is taking long time.I am using ICICI Credit card for payment. No if it will not confirmed till chart preparation then it will cancel automatically and if you travel with it, that means you are traveling without ticket. Since the start of this year 2016 Irctc is having almost no “service not available” errors .However the website Itself has gone through lots of advanced changes Mainly for the Tatkal bookings..
1st condition is that one needs to be a huge tech savvy & Even after being a huge tech savvy there is still only a 50-50 chagbe of getting a tatkal tickets . But again it also depends on what train, where you wanna go , what time of the year ,what month you plan your journey cause sometimes if there is no rush even withen 12 to 15 mins you cud still get confirmed tickets. The captcha is a much more difficult than before. Yes Parag there are lots of things that matters while you book your tatkal ticket. But the main factor that i analyzed is first the internet speed and other is the how fast you can fill details, even at the payment gateway. i almost made all tickets using the above trick. but since few days even then it results in Waiting list. Is there any sofware which are more faster like the time in payment is not wasted? Normal ticket booking is always on, just it is halt for some 15 minutes at 00:00 hrs to 00:20 for maintenance. How to book tatkal using paytm wallet? Do I need to register for irctc ewallet before using paytm? cAN I USE EWALLET FOR PREMIUM TATKAL BOOKING? E-wallet not working on Tatkal booking when it is highly needed. Its frustrating. Why one should opt for e-wallet. I recommending friends not to opt for e-wallet. You can use this money even for IRCTC food also. Sorry…You can not use this money even for IRCTC food also. I have booked two Tatkal tickets and total fares taken appx Rs.860/- and that time it was showing W/L 6 & 7. After chart preparation my tickets were not confirmed and after two days I got the sms from Indian Railway that refund has been initiated but amount Rs.720/-. I called up customer care (139) and asked the reason of deduction and the executive replied back that it is one of norms of Indian Railway that if you booked wait list tatkal tickets and even it will not get confirmed then also Rs.60/- to Rs.65/- will be charged per person and rest of the amount will be refunded to your account. It’s very unfortunate, we book tatkal tickets only when we feel our journey is highly required on emergency basis but here paying more than a normal ticket still unable to travel and railway deducting charges for not travelling due to their internal reason. What a joke…People are loosing money & getting harassed and Indian Railway happily enjoying the Fund for not providing the service to whon need it most/urgent. My PNR No.- 6200728016.
this is why they will never want private players here. That is the trick of railway ministry to get money from passengers. Why they have created advance booking as four months. Not all who booked four months before are going to travel on the same date. Many things happen in ones life. For temporary purpose they will book n keep n later they cancel. The idea of Irctc is like that. In cancellation itself they gain crores n crores. Only passengers like us are the sufferers. Railway says that it recovers only 46% of the cost of ticket. What about the money they get 4 months in advance and the interest it receives. What about cancellation charges, when none of the seats go empty. Why does the train charge so hefty cancellation charges. Tatkal tickets also cost more and if confirmed no refund is provided there the railways have earned good amount. Even unauthorised people enter reserved compartments and TC’s have a great income from it. Hi, Can I book Tatkal tickets using Paytm Wallet (IRCTC Mobile App) as this option is available in App during Tatkal hours. SBI debit card or net banking which one is better for tatkal bookings?? Very strange Indian railway system, really I wish it must become complete private only then things might change , Normally A agent books taatkal tickets in seconds but general public is denied the same.